Council voted to shift an additional percent of gas tax funding from transit to roads. Council amended the federal gas tax split from 70% roads and 30% transit, to 80% roads and 20% transit. This provides an additional $500,000 for roadways resurfacing infrastructure. At our budget meetings in March, council voted to shift an additional percent of gas tax funding from transit to roads. Council amended the federal gas tax split from 70% roads and 30% transit, to 80% roads and 20% transit. This provides an additional $500,000 for roadways resurfacing infrastructure. The gas tax money is for intended for transit capital costs (for example, new buses) and does not affect operating funds. In making the vote, council heard that the capital dollars are not needed till 2021. At the budget meeting, council heard from a number of residents who expressed concern about taking money out of transit to fund roads. What do you think? What is the best split in gas tax funding for roads and transit – the new one, the previous one, or some other ratio? Please comment below or email your thoughts to me meedwardm@burlington.ca. My Take: I’m a big believer in transit – it’s an investment in our community and a greener future. However, I did support the shift as a temporary measure to inject much-needed funds into our growing infrastructure gap – and buses use roads as well. We will have an opportunity to review the gas tax ratio at next year’s budget. By that time, we will have the results of the Transit Master Plan review which will provide necessary information on capital needs going forward. As I have said in the past Burlington is in need of a Transit shift from the elephants presently roaming the streets to small vans equiped to carry the three or four people that occupy the few seats of a Bus needed in a City like Toronto. Here we need small Vans built to carry eight to twelve people on the secondary routes at non rush hour times. (although with proper planning they could handle all times of the day) These vans could be purchased from a manufacturer such as Chrysler, Toyota or any other major manufacturer in a stipped down model without the added extras a Family Van would come wiith. The City could then purchase the same amount of Buses at a fraction of the cost and operate at a much lower overhead due to operating cost and storage due to the difference in size. As you say yourself, the gas tax money is intended for ‘transit capital costs’. Yes, buses use roads too, but the roads this money is earmarked for are back streets such as 1st street where buses do not go. As a result, this looks like a piece of sharp practice by the city to take transit money and use it for cleaning up residential streets. If it’s not against the letter of law, it’s certainly against the spirit. 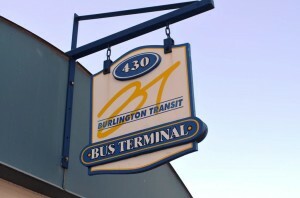 Burlington Transit is an essential service relied on by many of Burlington’s citizens. Better service would attract more people to transit, and that requires more frequent service and longer hours of service on some routes. The City needs to invest more money from the gas tax on buses in order to provide better service. I hope the reduction of the gas tax split from 30% to 20% for transit is for this year only. I am fully in favour of spending gas tax money to make our arterial roads safer, better for transit, and a smoother ride. Transit isn’t much good if the roads on which it travels fall apart??? My vote would be to spend more money on the roads.